feel better and enjoy your weekend at the beach!! Love the colour of the blazer. A nice change from black or navy. 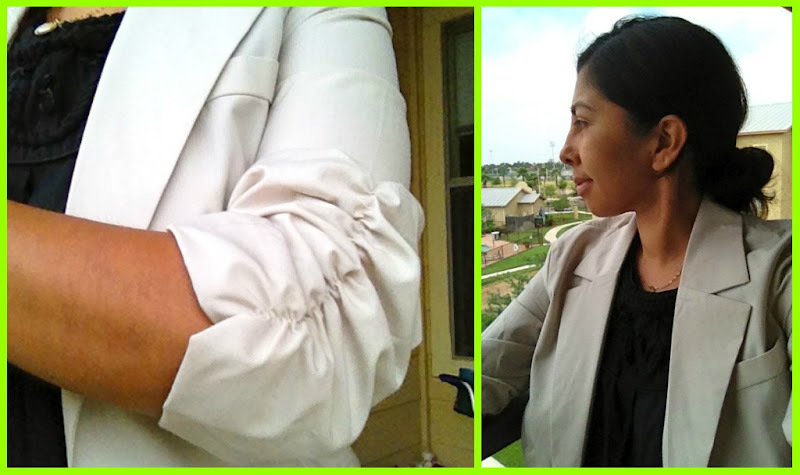 I like the sleeve design on your blazer and your right they are super versatile. Hi friend! I'm so sorry about the bite. That is awful. I hope you are on the mend now. You look cute in the pictures and I love the blazer. I love layering, which is something I never used to do. Sorry that it's been a rough week for you. I hope the beach and spoiling yourselves rotten this weekend cures everything! Sending you a big hug. xo. sending a big hug, and peaceful vibes for your spoiling weekend at the beach! the weather is perfect for a beach adventure. and i think the water must have warmed up enough for a swim...judging from the masses of happy swimmers i saw in the bay yesterday. ack! hope the bug bite has fully healed and that you enjoyed a fab weekend!